I’ve long been a fan of David Allen’s approach to Managing Yourself – what I call Skill 1. And since I’m also a long time fan of new technological tools (OK – toys) I keep an eye out for ways to streamline my own self-management “system.” A key ingredient to any effective system is to have a comprehensive overview of all the things on my plate (my commitments, projects, and next actions) and all the things on my radar screen (things I’d like to have, learn, or do at some point, just not right now). Once AT&T was able to offer service in our semi-rural area we jumped at the chance to switch from our Palm TXs to iPhones after making sure the iPhone could sync with MS Outlook. I checked the Internet to see what ad-ons might be available to help manage and sort Tasks (the iPhone operating system ignores Outlook Tasks). It looks like 2Do from Guided Ways Technology may well be the answer, but we’ll see as we go along. Being effective at Skill 1 means always looking for ways to improve your personal management system. Fortunately, for me that means trying out new toys and tech. Unfortunately, it takes time and mindshare to do that. What self-management tools are you using these days? Drop by and leave a comment; I’d love to know what you use and what works for you. For more information on Skill 1 and Managing Yourself, order your copy of “The 8 Essential Skills” from Amazon.com. today! You’ll be glad you did! And while you’re at it, stop by our web site and learn more about our approach to Personal Productivity. For those of you managing nonprofit organizations – we’ve been asked to develop a 5-session workshop series for our friends at ONEplace@KPL. This series is designed for entry to middle-level directors and managers in all areas of nonprofit organizations (executives, programs, services, administrations, operations, fund development, communications—anyone who supervises others). Each session will be 2.5 hours and will run on five successive Monday’s from 9:30 a.m. to noon. Interested? You can learn more by visiting the workshop announcement and topic schedule at ONEplace. And while you’re visiting, don’t forget to check out the rest of what Bobbe Luce, her staff, and her network are doing – it’s great stuff! Next Time: More Communications Stories from the Trenches. PS – watch for my upcoming interview about “The 8 Essential Skills” on Mary Jo Asmus’ outstanding blog, Leadership Solutions. I have long been fascinated by the concept of “talents” – those innate “gifts” that people have. I used to think that talent was mostly a creative, artistic ability as in playing an instrument well and seemingly effortlessly. Van Cliburn, Yo Yo Ma, Oscar Petersen, or Ella Fitzgerald for example. Or, think of world-class athletes such as Michael Jordon, Venus and Serena Williams , Phil Mickelson, or Derek Jeter. Although we know such skill is the product of lots of hard work, there also is the element of natural talent at work in each of these examples. It turns out that we all have talents; things that we do that produce consistent near-perfect performance in a few key areas of our life. Decades of research by the Gallup Organization revealed that each of us have these innate gifts and that turning our talents into “strengths” is possible as we acquire knowledge and experience. The best current “take” on talents and strengths seems to be in Tom Rath’s book StrengthsFinder 2.0. Each copy of Rath’s book contains a one-time computer code for taking the assessment on the Gallup Organization’s web site. If you haven’t explored your own talents, pick up a copy from your local bookstore or order from our friends at Amazon.com. Might be a great opportunity to order a copy of my new book too! 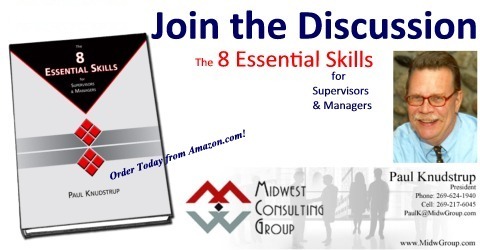 To order “The 8 Essential Skills for Supervisors & Managers” visit Amazon.com. What are your particular Talents? Early in your brain’s growth your nervous system developed a dominant pattern for processing information, using your three primary senses. One sense is the best-developed – your “conscious” sense. One is not as well developed, but helps to support your strongest sense; let’s call that your “subconscious” sense. The third sense is significantly weaker; we call that your “unconscious” sense. While you do use all three senses to take in and process information, your dominant or conscious sense is simply more effective. So, what does this mean for you? For me? My weakest sense is Auditory – information that is only “told” to me simply doesn’t seem to get processed effectively in my brain. What I see and experience, however, seems to make more sense and create more lasting impressions for me. Like many who are primarily Visual and Kinesthetic, seeing/reading information and writing/drawing/notetaking seems to “lock in” the information. I often take notes during meetings and the physical (kinesthetic) act of writing the note plus the visual act of seeing the information on paper tends to make the information “stick” much better, even if I don’t look at my notes ever again. What about your information processing preferences? Which senses seem to work best for you? Which sense seems to be the least effective way to gather information? We use both “sides” of our brain all the time and constantly, however the nural connections are usually more well developed on one side. That side becomes our “dominant” hemisphere and seems to get used for about 60% of our mental work. Our dominant “side” has a profound effect on the way we prefer to learn. Left-brain people seem to learn best through understanding the details, facts, and logic of an issue or situation. In school they usually prefer objective, fact-based tests. They tend to be interested in “how” something should be done. Right-brain people seem to learn best through understanding the “big picture” first and look for patterns and relationships among the facts and details. Usually their visual sense is fairly well-developed and use color, music, and drawings to anchor what they learn. Not surprisingly, Sensors are more likely to be left-brain dominant and iNtuitives like me are more likely to be right-brain dominant. Think about yourself; perhaps you know which “side” tends to be your dominant hemisphere. Maybe you’ve never thought about it before. Then ask yourself how you can better use this part of your hardwiring to be better at the things that are really important to you. The next step in the journey. Some would claim that Communication is the most important skill. Others would argue that being good at Solving Problems and Making Decisions is the most important. Still others will assert that Building Successful Relationships is more important than anything else. I believe Managing Yourself is Skill 1 – the most important and critical initial skill. And, of course, I’m about to tell you why. The ability to effectively manage your own life is, to me, the foundational skill – all the other skills flow from this ability. Learning, developing, and practicing good self-management puts you in the position of being able to acquire the rest of the 8 Essential Skills And the opposite is also true; the supervisor or manager who is poor at managing themself is going to have a difficult time acquiring the rest of the skillset. The result is a rather ineffective, probably unsuccessful manager. We’re not talking just about managing yourself at work. What I really mean is learning how to handle the pace and density of our modern life. Life is a combination of professional and personal tasks, projects, relationships, plans, information, and challenges. The sheer volume of information, ideas, communications, commitments, projects, and tasks tends to grow all the time. The mix changes constantly, as do priorities. And as our careers advance and our personal life progresses, the more complex the mix seems to become. Managing Yourself involves learning a set of skills, but more importantly, it involves knowing who you are, what you stand for, and what drives you as a person. Managing Yourself starts with knowing yourself. Next Time: What’s Your Hardwiring? If you are not yet acquainted with David’s teachings and his Getting Things Done (GTD) approach to self-management, you owe it to yourself to find out; we are big fans of his here at Midwest Consulting Group and MCG Press. I make frequent reference to his ideas in Skill 1 – Managing Yourself section of The 8 Essential Skills.